As you all know by now, I love to make lists. Especially lists of goals! Having bipolar disorder, I make lots of goals and lots of lists when I am hypomanic, and then I rarely end up checking them all off. I still like to make them, though. In 2009, I wrote a "30 by 30" list--30 goals to accomplish by the time I turned 30 years old. On that list, I included what was a seemingly impossible goal: to enter a 5K race and RUN it. At the time, I hadn't even run a single step! I had barely started losing weight. But I threw that on there, because it sounded like it would make a good goal for a list like that. I never really expected to complete it, because bipolar. Anyway, I told my friend Renee about the list, and she asked to see it. She saw my 5K goal, and then for my birthday, she gave me a card saying she wanted to help me with that goal (she's always been a runner) so to pick a race and she'd do it with me. I would have felt embarrassed to say no--it was on my list, after all--so we chose a race. And thus began my journey into running. Runs for Cookies wouldn't exist if not for that 30x30 list, so it was a pretty good list! Lately, I've been dealing with mild depression, and I decided to try to focus on things to take my mind off of it. 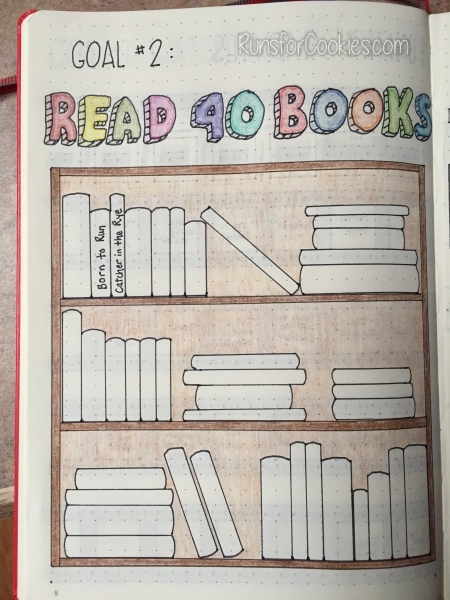 I've also been working on things in my bullet journal, so I had the idea to create a 40 by 40 list and make a bullet journal structured entirely around it. My list, and then each goal will have a page devoted to accomplishing the goals. I'm currently 36 years and 3 months old, so I have 3-3/4 years to accomplish these. (Seriously, when on earth did I get closer to 40 than 30?! I feel like I should still be 25.) I tried to keep these from being crazy ambitious (like traveling the world) because honestly, that's not going to happen in the next four years. I feel like this list is do-able. There are some goals that are immediate, one-off things that can be accomplished in a day. There are some that need planning, and some that need money, so those won't be as easy. Then there are some that are cumulative, and will take close to 4 years to complete. ***I am already counting the states I've been to--I don't have to visit them a second time. Again, coloring these in as I visit them. 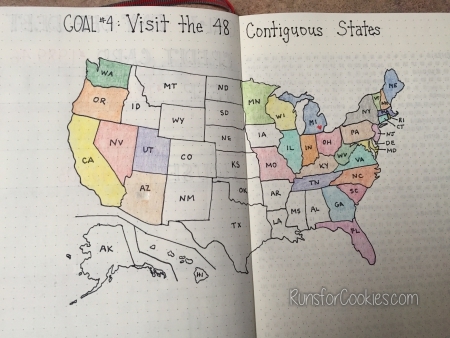 I included Alaska and Hawaii on here, just in case; but I don't really have the desire to go to Hawaii, and the expense would be too much just to check it off my list. Alaska is one place that I am dying to go, but it is unlikely in the next four years. ****Jerry is a HUGE Star Wars nerd, but I have never watched a single Star Wars movie. I am determined to make myself sit through one. Just for him. I LOVE THIS LIST!! I would be happy to help you cross off a few on your list (concert, road trip, drive-in, etc.) - let me know :) (Actually you are on my 36 by 36 list and I only have 7 months left! You are so artistic! 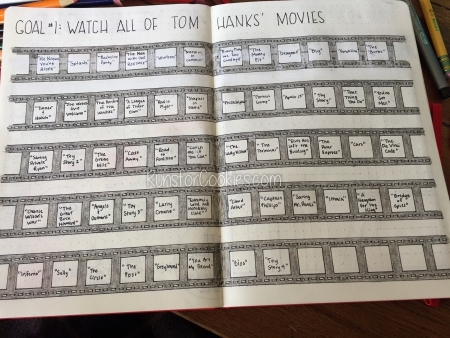 I can't believe you drew the film strips & map by hand. Amazing! TOM HANKS YES! He is my fave too. I love this list! And your bujo skills are top notch. I tried to start one and did well for a month, but then forgot about it! Love your beautiful and creative lists! What pens/pencils do you use? For your concert you should consider an outdoor venue. In Cleveland we have Blossom ...there's an amphitheater and lawn seating. It's a great place for a concert! 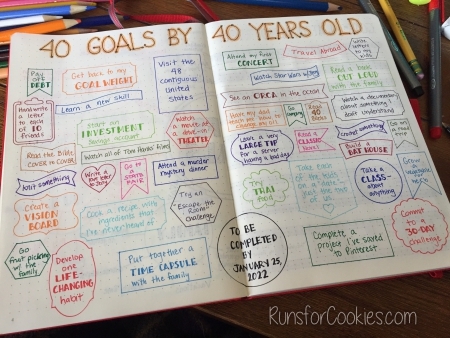 I love this and the creativity of your journal is awesome. I always wanted to start one but my handwriting is so bad I just can't focus on anything but that lol So silly, I know but I also know you probably get that. Love this! I thought the same thing about Star Wars when I started dating my husband. But he forced me to sit through at least one and now I love going to the new movies with him! You're such a great artist! I love that drawing of books on a shelf to fill in your titles. So cute! Have fun with your list. This is such a great idea!! 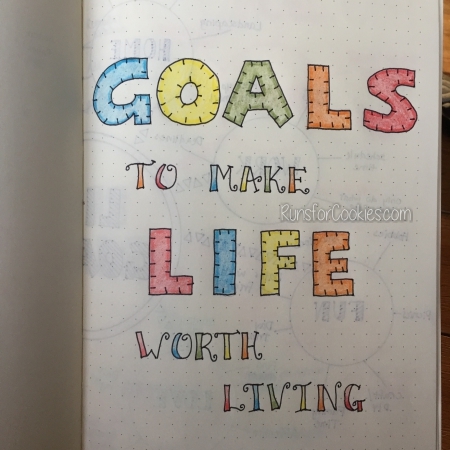 This list is awesome, and I covet your bullet journal skills! That should be my next goal, to make one as nice as this! What a great list! And you are so talented and creative in making it look so beautiful. I love the bookcase drawing for the books read goal. If you ever are traveling close to the very Northern tip of VA (Winchester), we have a drive in theater nearby that is open most of the year. It shows first run movies on two screens, had a playground and a concession stand. It's so much fun to go in the summer and just enjoy an evening of movies under the stars. Love this! Your artwork is beautiful. Katie I love your journals. They look like they take a lot of time to draw. I'd love to try this - but how do you do it? Did you draw the US??? I simply cannot get past these drawings! They're beautiful! Do you do them in pencil then color them in? I can see that you have a grid (clever!) but even with that I would totally botch any and all of those drawings. Well done! This is soooo cute and fun looking! We are almost exactly the same age so your idea is giving me major inspiration too. Please share more of the pages as you write/draw them! What a great list. From the sublime to the everyday. I had a few goals on my original weight loss journey. I was determined to be under 200 lbs. by my 60th birthday on Jan. 1, 2011. I made it. But here I sit today, at 67, and 216 lbs. I am thoroughly disgusted with myself. I am now closer to 70 than I am to 60, so perhaps it is time for me to make a list like yours, of goals to accomplish by 70. Number 1 on my list will probably be just to survive to 70! Number 2 is to get back to my goal weight of 150! You've inspired me! I turn 30 in a year and 5 days, I'm going to make a list of things I want to do before my birthday! Also, how do you make your bullet journal drawings so nice? Are you just super talented? Mine always look terrible! I just went to an event over the weekend where self improvement was a topic. One of the speakers told us that the wealthiest people in the world read 30 books a year and that we should try to read 12 books a year, 1 book a month. To help us achieve this we need to read 10 pages a day and to make it even easier read 5 pages in the morning and 5 pages at night. By reading 10 pages a day you will read 300 pages in a month and the average book is less than 300 pages. My husband and I are both going to tackle this goal starting May 1. So give that a try and I guarantee you can read 40 books in 4 years, because we all know if you get sucked in, you can finish a book sooner than 30 days. Also, I'm the travel agent you chatted with last year and if you need any help finding good rates on hotels to see some of those 48 states, let me know. I recommend a cruise for Alaska if you want to see it. It is by far the cruise destination I book most and everyone comes home raving about the trip. I'm going next year and cannot wait! I love your list. I'm amazed by your drawings. Am also a Tom Hanks fan and I think that is a fun goal. LOL. Nice way to put in some "down" time for yourself. I've never read Catcher in the Rye either. But Born to Run was an interesting read. I went on a reading kick a few years back devouring inspirational athlete stories. Let me know if you want some suggestions. This is such a fun idea! I like that most of the things on your list are easily doable if you just decide to check off an item one day. I also really like the drawings you will fill in as you go; it will be neat to watch the progress you make. For reading books I'd recommend making lists of books you'd like to read/tracking books you've read on Goodreads -- I've read a lot more books since being able to remember the books I'd like to read and seeing my progress on the site. I have had the goal of reading the entire Bible for years, and I finally decided to listen to it instead. I found a podcast, Daily Audio Bible, and this guy reads it to you each day for a year. He’s been doing it for many years, but starts over every year on January 1. I started it a month or so ago so I’m playing catch up, but it has me finally feeling like I’m going to accomplish this goal! Some parts are tough (and just really boring quite honestly), but it’s much more enjoyable listening to it. I recommend it! I LOVE the tip for a server one! What a super, thoughtful idea. Especially since it means you’ll be turning their entire day around. Great list Katie!